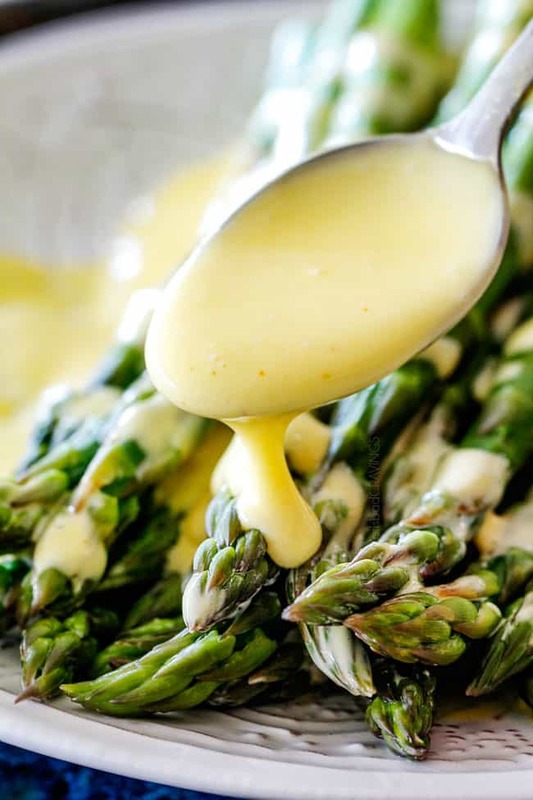 This Blender Hollandaise Sauce is the quick and easy version of Classic Hollandaise Sauce BUT tastes every bit as decadently delicious. It’s fool proof, never breaks or curdles and takes less than 5 minutes to make! 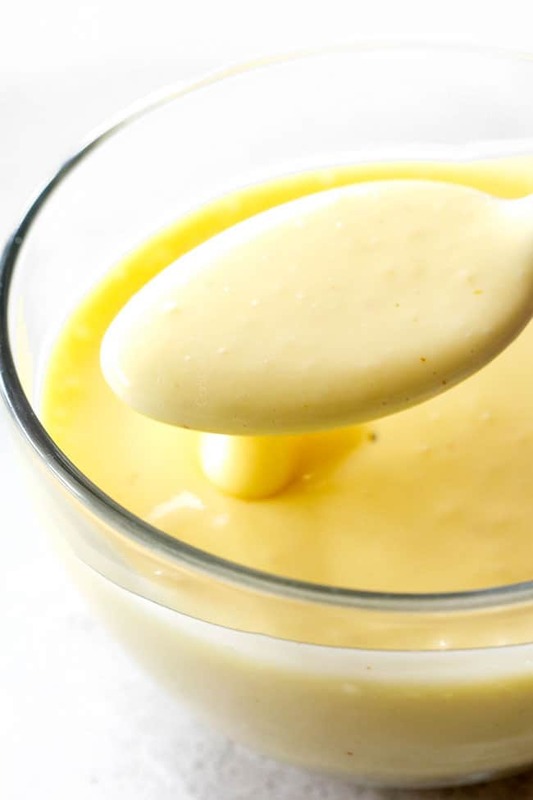 If you can melt butter and push “blend” – you can make this Blender Hollandaise Sauce! It’s fabulous on eggs, seafood, asparagus, etc. and the perfect something something to impress for Easter and all your holidays! If you’ve ever devoured Eggs Benedict, then you’ve had the pleasure of inhaling rich and creamy Hollandaise Sauce. It’s a “special occasion” sauce in my book because it’s made with a lot of butter. And it tastes like it. 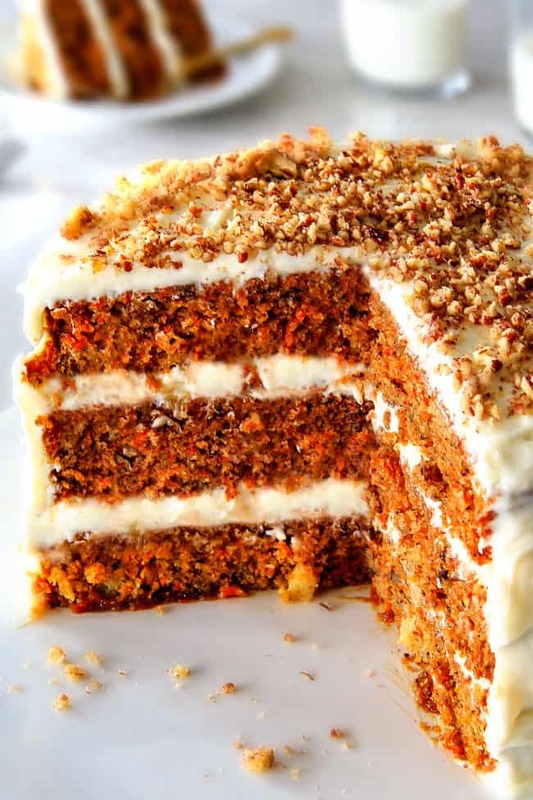 It’s rich, decadently creamy, tangy, buttery and drinkabley delicious. So in preparation for my Eggs Benedict Casserole I’m posting for Easter (update – now here! ), I bring you this Blender Hollandaise Sauce. Both are shortcut recipes with allllllll the flavor without all the work. winning! If you are looking for a Hollandaise Sauce without all the calories, my Greek Yogurt Hollandaise Sauce is also a fabulous alternative. 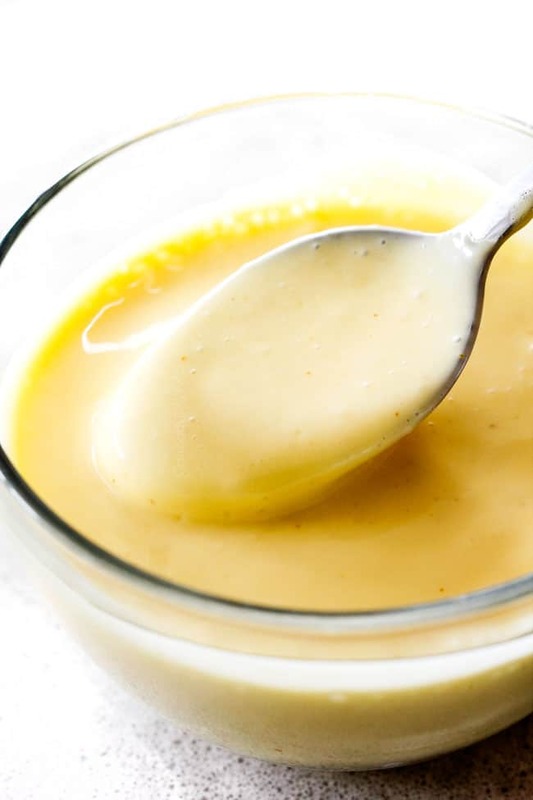 Hollandaise Sauce is soooo good, it’s one of the five Mother Sauces in French cuisine (despite the Dutch name origin) – AKA you need a Hollandaise recipe in your life! Classic Hollandaise Sauce is an emulsified sauce made by whisking lemon juice and butter with egg yolks over a double boiler. Although pretty simple, this method can often curdle or break – but not Blender Hollandaise Sauce! With this Blender Hollandaise Sauce you never have to be afraid or intimidated by Hollandaise Sauce again! 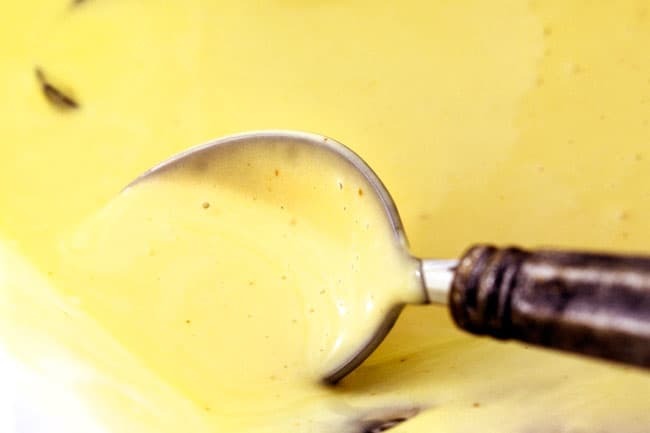 I’m not sure where Blender Hollandaise Sauce first originated, but it’s documented in Julia’ Child’s “Mastering the Art of French Cooking” where she describes, “the technique is well within the capabilities of an 8-year-old child.” Now that’s what I’m talking about. Why double boil and whisk and whisk when the blender can do all the work? So let’s get to it! Add egg yolks, lemon juice, Dijon mustard, salt and cayenne pepper to blender. We get the blender ingredients ready first so we can add the butter while it’s still very hot. The Dijon mustard is optional but I personally prefer the tang of Dijon with the tang of lemon as opposed to all lemon tang. 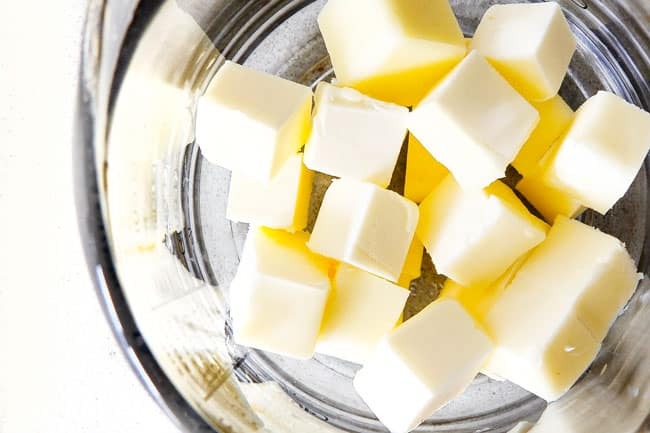 Add butter to a glass measuring cup and cover with a paper towel or plastic wrap (so it doesn’t splatter) and heat butter in the microwave for about 1 minute, or until completely melted and very hot. It is essential that the butter be hot in order for the Hollandaise to thicken. 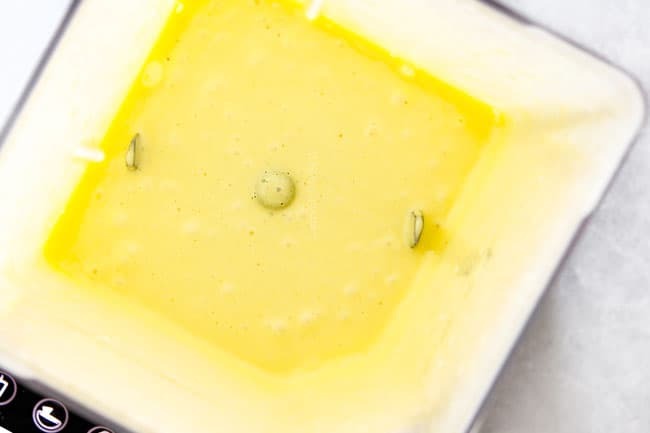 Alternatively, you can melt the butter over medium heat in a small saucepan until melted, hot and foamy (but not boiling so it doesn’t steam away and don’t let it burn!) and then transfer to a measuring cup or something with a spout so it’s easy to pour. Cover the blender and blend egg, lemon juice mixture (without butter) at top speed for 20 seconds. 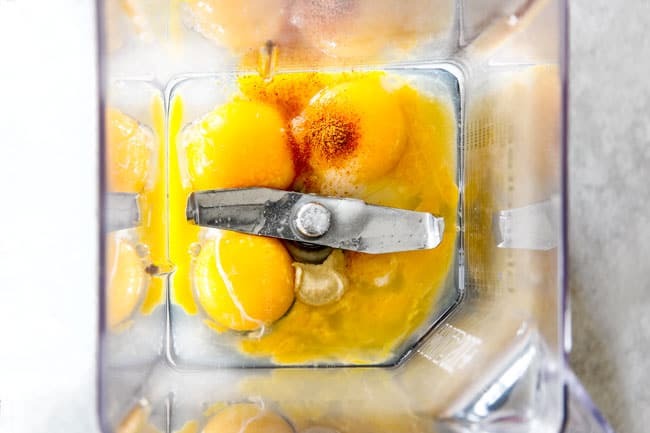 The friction of the blades will gently heat the yolks and the blending will add some air to make the Hollandaise lighter. Turn blender to low speed and remove the cover insert. Continue to blend at low while you pour the in the melted, hot butter in a slow, steady stream. The blender should run the entire time, and you should be careful to pour in the butter slowly. Cover insert then blend on high speed until thickened. If it isn’t thick, just keep blending on high until thickened. The friction of the blades at high speed will cause the sauce to thicken. Once the Blender Hollandaise Sauce is thickened, taste and add additional lemon juice, cayenne, salt and pepper to taste if desired. If you want the Blender Hollandaise Sauce thicker, continue to blend on highest speed until thickened. If you want a thinner consistency, add a little warm water and pulse to combine. 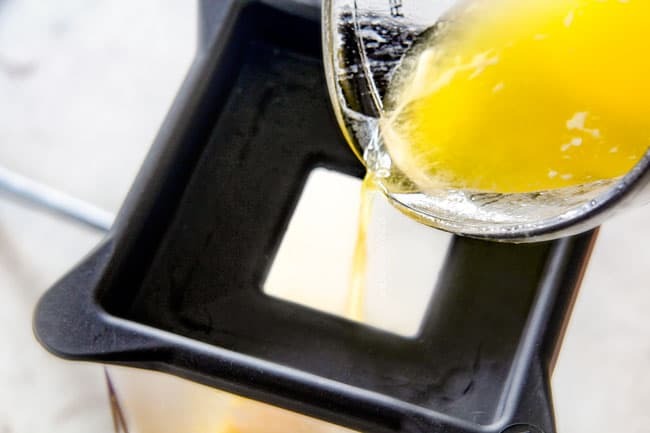 You might be a little wary of using raw egg yolks in this Blender Hollandaise method as opposed to the classic method where they are cooked over a double broiler. Using egg yolks is common practice in Caesar Salad Dressings, Chocolate Mousse, etc. and the friction of the blender and the scalding hot butter essentially “cook” the egg while blending. In fact, most Blender Hollandaise Sauce recipes don’t provide any disclaimers, but to be extra safe and for peace of mind, I suggest using pasteurized eggs. Pasteurized eggs are just a little more expensive but pasteurization destroys any potential bacteria and viruses so they are completely safe to eat raw. Pasteurized eggs are heated in their shells to the exact temperature needed to help destroy bacteria—without cooking the egg. After pasteurization, the eggs are sealed with an FDA-approved, food-grade wax coating to prevent contamination and preserve product freshness. Hollandaise Sauce should be refrigerated within 2 hours of cooking then can be reheated per instructions below. This Blender Hollandaise Sauce is best prepared right before serving and should take less than 5 minutes to make. If you need to make it a little in advance, then keep the sauce warm until serving by placing the blender container in a pot of hot water. You can keep in hot water for about one hour then replace the hot water. Instructions for reheating below. Can you Reheat Hollandaise Sauce? 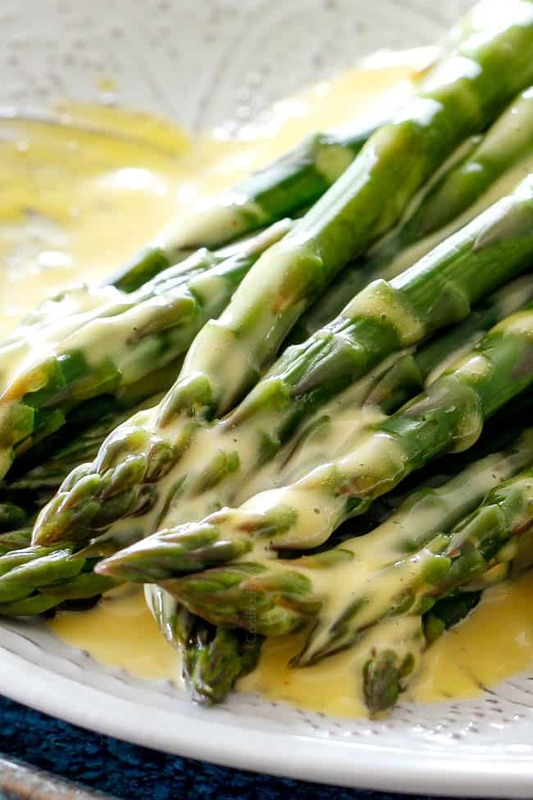 Yes, Hollandaise Sauce can be made one day in advance and reheated – just carefully! We need to babysit the Blender Hollandaise Sauce while its reheating or it will cook the egg yolks. Microwave: Add Blender Hollandaise Sauce to a microwave safe bowl. Microwave Sauce at 50% power in 15-second increments just until warm – BUT NOT HOT, whisking in between increments. Stove Top: Place the Hollandaise in the top pan of a double boiler or in a bowl set over a saucepan of simmering water and heat just until warm, stirring often. What is good with hollandaise sauce? Aside from drinking the buttery bliss, you Blender Hollandaise Sauce is famously fabulous on Eggs Benedict (and my no hassle Eggs Benedict Casserole coming Saturday!) 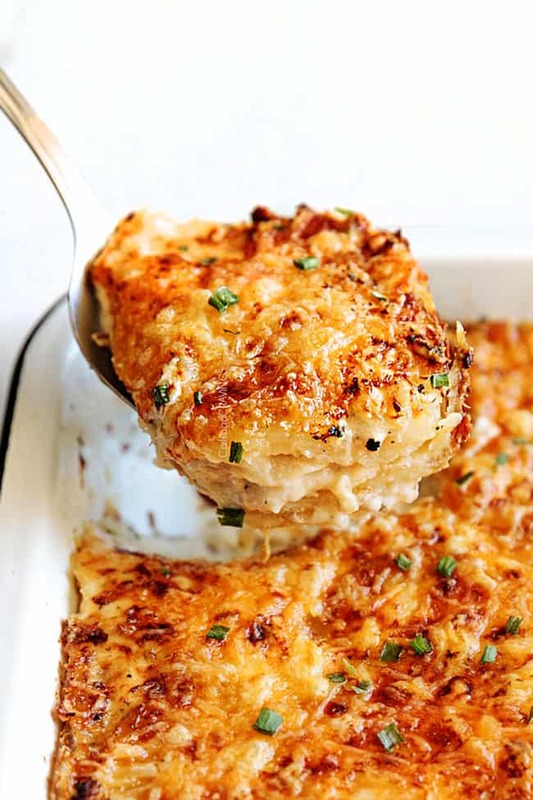 asparagus, fish, shrimp (all types of seafood), filet mignon, most vegetables – and of course Eggs Benedict Casserole. Be excited, be very excited. 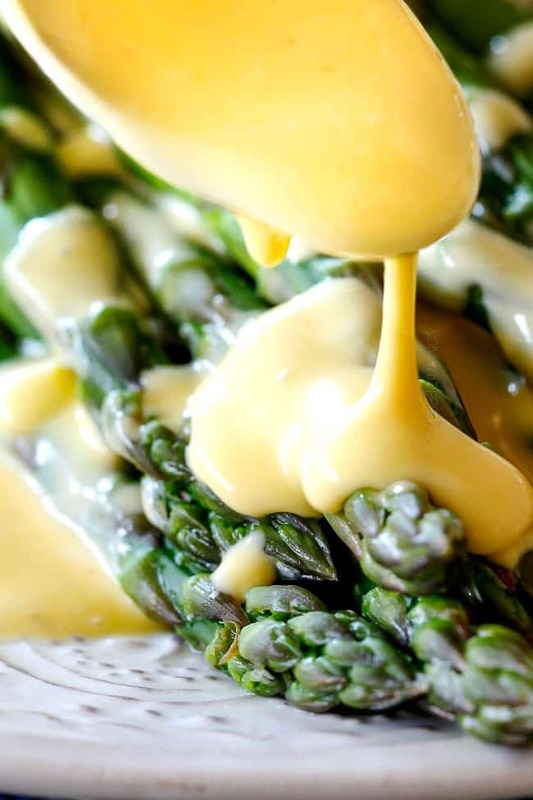 Want to try this Blender Hollandaise Sauce? 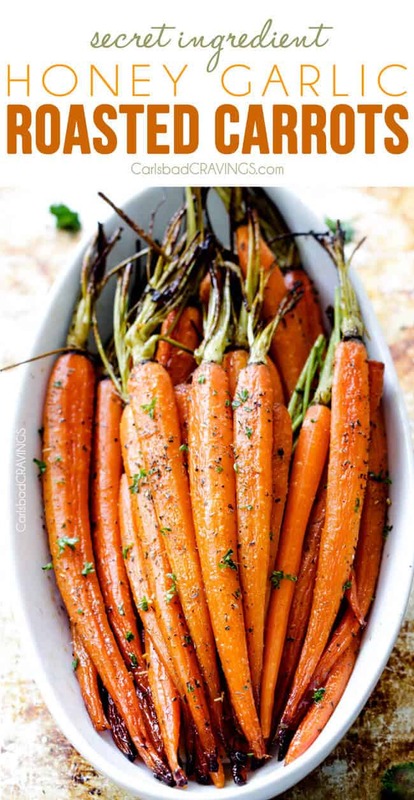 Pin it to your BREAKFAST/BRUNCH, SAUCES, HOLIDAY Board to SAVE for later! 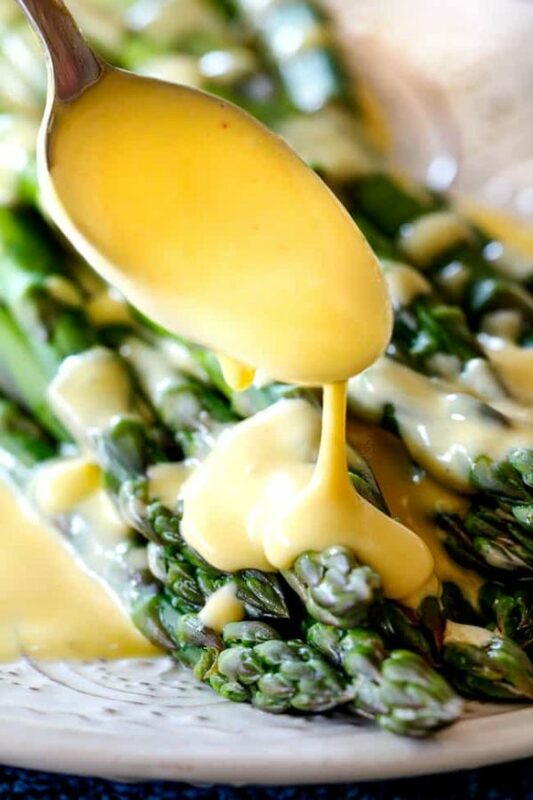 Blender Hollandaise Sauce that’s luxuriously creamy, buttery, lemony and SO easy! 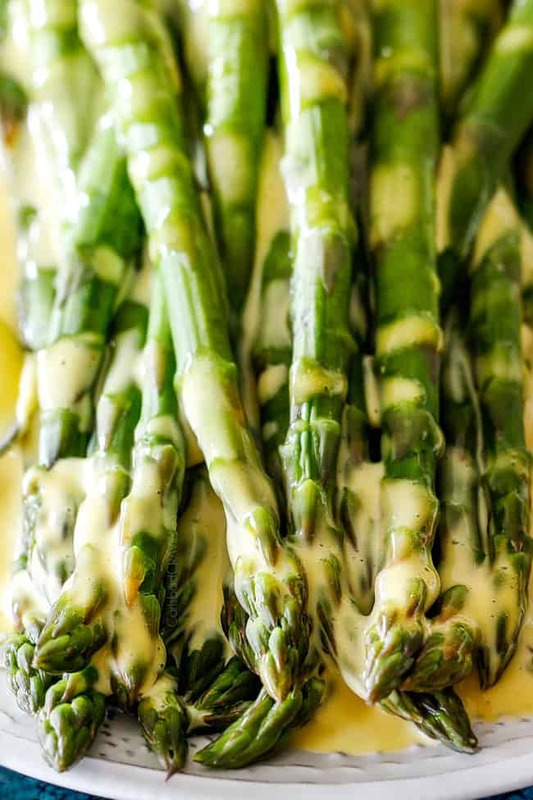 You will never go back to Classic Hollandaise Sauce again! 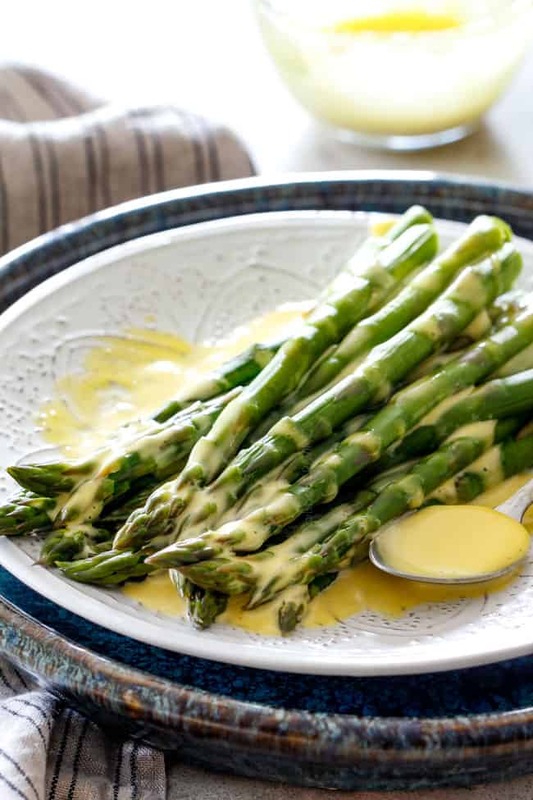 This recipe is the quick and easy version of Classic Hollandaise Sauce BUT tastes every bit as decadently delicious. It’s fool proof, never breaks or curdles and takes less than 5 minutes to make! It’s fabulous on eggs, seafood, asparagus, etc. and the perfect something something to impress for company and all your holidays! Add egg yolks, lemon juice, Dijon, salt and cayenne pepper to blender. Set aside. Add butter to a glass measuring cup and cover with a paper towel or plastic wrap (so it doesn’t splatter). Heat butter in the microwave for about 1 minute, or until completely melted and very hot. Cover blender and blend mixture (without butter) at top speed for 20 seconds. Reduce to low and remove insert from blender and continue to blend while pouring in melted butter in a slow steady stream then immediately cover. Increase speed to highest power and blend until thickened. If it isn’t thick, just keep blending on high until thickened. Keep the sauce warm until serving by placing the blender container in a pot of hot water. Stove Top: Place the Hollandaise in the top pan of a double boiler or in a bowl set over a saucepan of simmering water and heat just until warm, whisking often. Our family loved the Blender Hollandaise Sauce and it was so easy to prepare compared to traditional Hollandaise. YAY! I love hearing that Tiffany, thank you so much! 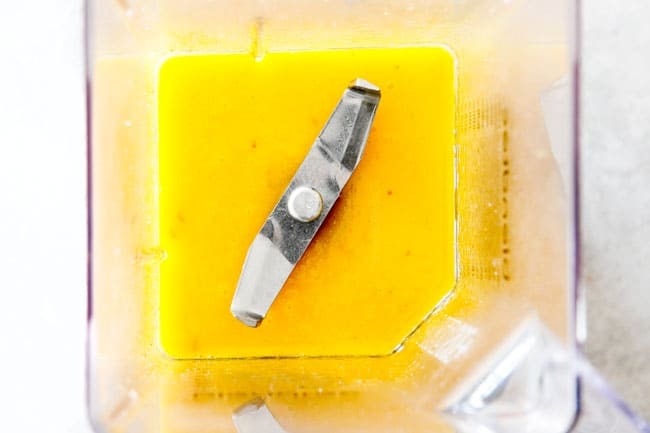 Can you freeze the hollandaise sauce for use at a later date? No I don’t recommend freezing it or the texture will become funny. Sorry!